601. Baroda, Sayaji Rao III (VS1932-95/1875-1938 AD), Silver ½ rupee, VS 1951 (KM-Y35a) 2 annas, VS 1949 (1892) & VS 1952 (2), (KM-Y33, Y33a) milled coinage. 606. 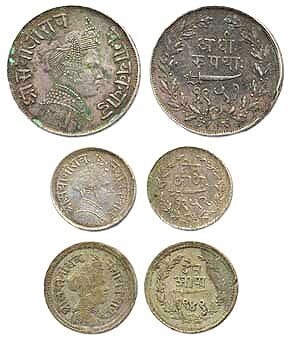 Bundi, Silver Rupee in the name of Queen Victoria, hammered coinage, (VS 1923/1866) with die error. 607. Bikaner, Dungar Singh (AH 1289-1305 / 1872-1887 AD) Silver Rupee, Local coinage, Bikanir, 11.4 gms (KM#54). 608. 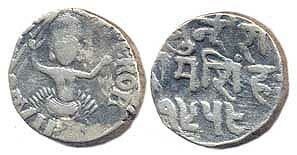 Dhar, Silver Rupee in the name of Shah Alam, Anandnagar, with mint mark sword, AH 1202/29, 11.4 gms. Unlisted. 610. 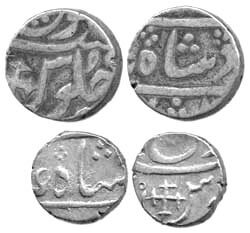 Indore, Holkar Silver Rupee, in the name of Shah Alam II, Jafarabad urf Chandor, 11.4 gms (KM#3.2). 615. 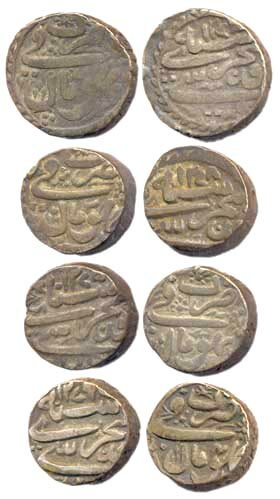 Silver Rupee in the name of Bahadur Shah II, Sawai Jaipur, AH x/39, 10.8 gms (KM# 93).